The diagram above depicts how your host PC should be set up . Basically what you see here is that standard Bluetooth on the host machine is capable of providing COM Port based communication. COM ports go back to the days of RS232 serial and Centronics parallel communication.They take care of the transmission of bytes between machines, Once you have a COM port open each device can send bytes down the wire. 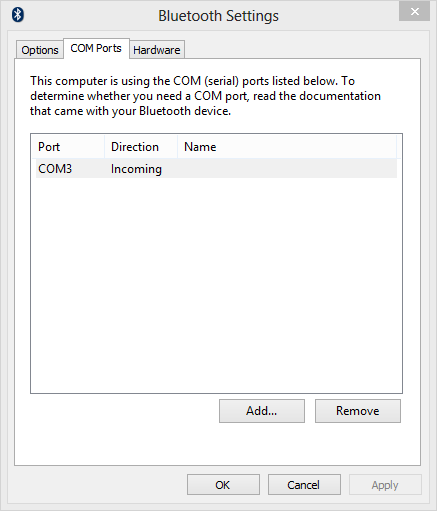 You need one incoming COM port, this is done by tapping the add button and selecting incoming as the connection type. 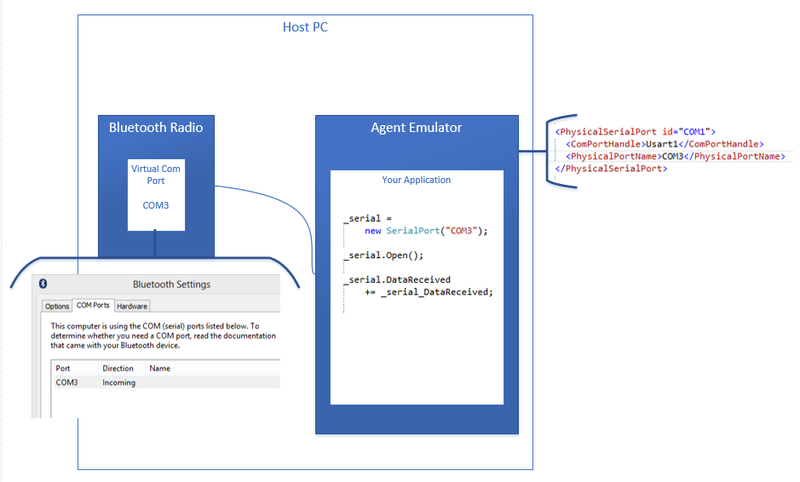 You are now ready to start writing code within your agent application that accepts connections from external paired devices. One area where people get bogged down in when paring a phone with your local PC is that after paring the phone does not stay connected. They tap on the phone in the list and it says connected but then appears to drop the connection after a short period of time. To understand this you have to ask yourself why would the phone want to be connected via Bluetooth in the first place.The answer being that there isn’t any reason for it. There are no shared services that are part of each OS that require a connection so when the phone realises this it drops the connection. It’s not until your application opens a connection to a service on the paired PC that the connection becomes active. From what I know and given this scenario it is not possible for the Agent application to initiate communications with the paired device. NOTE: The rest of the code mentioned here will be based upon the AGENT SDK v0.1.1 (June 2013, Preview Release) and will be subject to change as the SDK gets closer to it;s version 1 release. 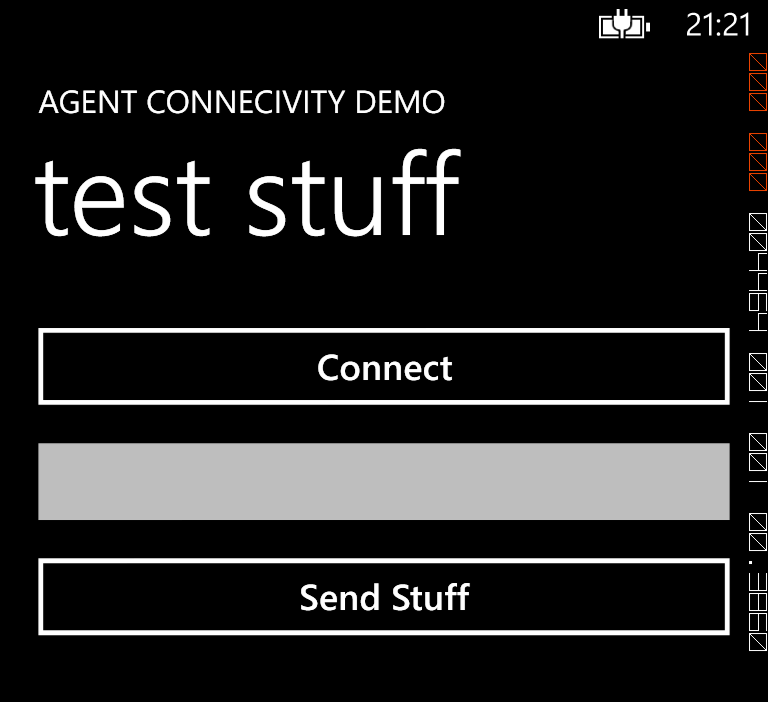 Given that the Agent emulator has a virtual COM port all the work is carried out using Stream based objects. The System.IO.Ports.SerialPort object is derived from System.Stream, so if you are familiar with working with streams then this should be familiar territory. Ok so now we need to know when data is being sent to the application.This is best done by adding an event handler to the DataReceived event. Agent app wise that’s it for this blog post if you want to see more implementation then have a look at the demonstration code linked at the bottom of this article. 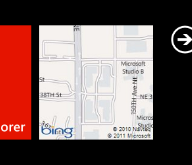 A good place to start when writing a Bluetooth application for Windows Phone 8 is the Bluetooth App to device sample. My example uses some simplified code to connect to the target machine and then send some data to the agent application. This code is initialises the peer finder service then gets a list of devices. After that it users a filter of the list to find the peer that contains the name that is given by you (replace the ****YOUR PC NAME HERE*** with the name of your PC as it appears in the devices list). If the function returns true then a socket connection to the Agent application has been made. In this case the sending of data is simple because we have the use of the DataWriter class to make things easy for us. If you are looking for a way to add NFC support to your windows store applications then you have two options. The first is make sure you buy your hardware with an in built proximity sensor. This option is quite a layout of cash if you already have a desktop/laptop etc that you do your development on. The second option is to purchase an external NFC card reader. For this your options are limited because of Windows 8 driver support. There is one however that was found by both Peter Footand Craig Hawker this is the FeliCa RC-S380 compact USB NFC reader and it is available in the UK from NFC Stuff at £88.68 (delivered). That’s it you now have a machine that will allow you to develop NFC enabled Windows Store applications. Thanks once again to Peter for helping me out. Hello again! It sure has been a while since I last posted but I am now going to get back into the swing of things, to start things off here are some thoughts I have had in regards to notifications and companion devices on the windows phone platform (A cross post from a forum post I made on the verge that can be found here: http://www.theverge.com/2013/2/15/3991692/windows-phone-notifications) . What is lacking is that the application notifications are missing. These notifications are the toast notifications that can be pushed to your phone by an external service or raised by one of the background services running on the phone (don’t get me started on those). I admit this is a little hidden and maybe could do with an easier route UX wise. 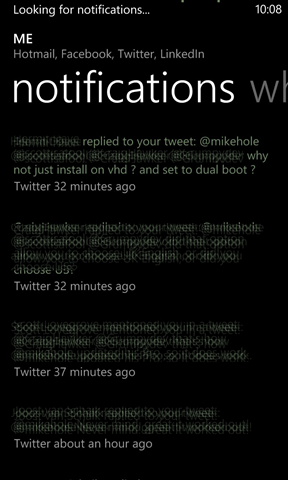 But IMHO all that is required is that this list is added to when a notification is raised. 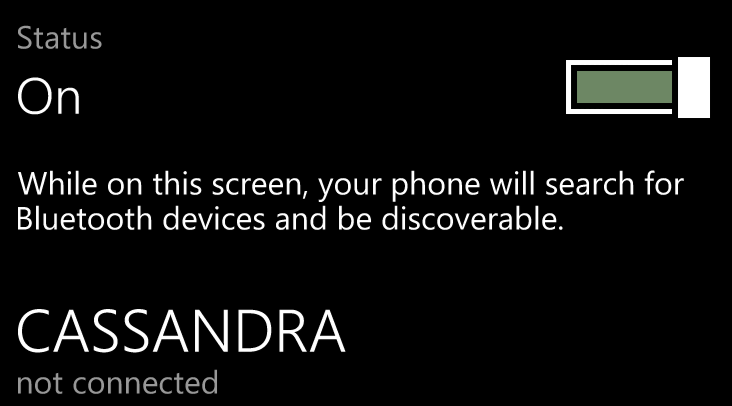 It’s the simplicity of this that confuses me when Microsoft say they couldn’t get this into WP8 before release. All of this adds up to the need to be able to push the notifications including the number of unread emails, TXTS etc. out from the device onto an external display via a third party service. Something that the sandboxed environment that developers are provided with just does not allow. Another problem is that the background tasks that the API provides are now allowed to run as regularly as is required or a task like keeping a companion device updated. The way I see it is that the API requires a new app capability that is associated with a request for access to the user to allow the application to gain access to the notifications and read information like email, texts and calls (calendar and contacts are already a feature). This will also require an event based hook so then an application can register to be notified when a relevant phone based event happens rather than having to run an agent in the background. All lot of work to be done please MS please make it so! 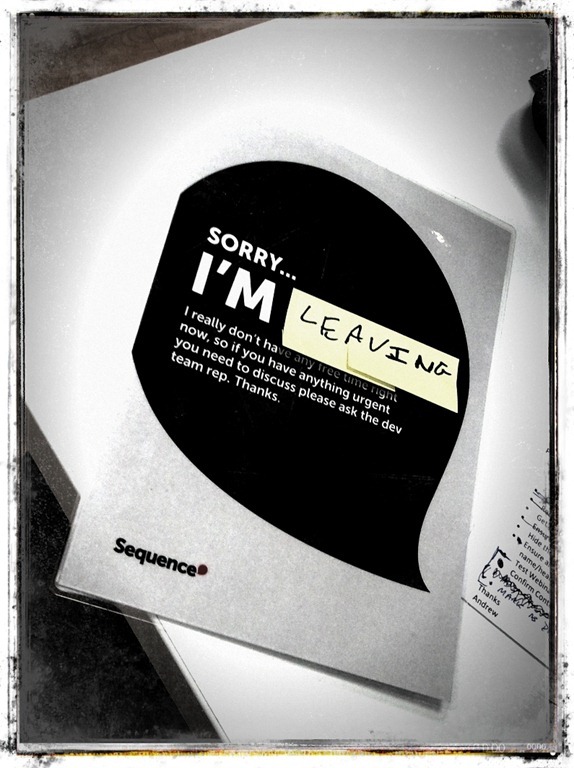 Friday 28th October will be my last day working for Sequence a talented full service Digital Agency in Cardiff. I started in Sequence back in January 2007 where I had my sites firmly set on being a development team manager. After a year of trying I found that I had actually re-discovered my love for crafting code and designing / developing systems so I settled back into the position of Senior Developer. During my time at Sequence I have had the pleasure of working on a variety of projects that have ranged in size from a small application to a large enterprise system. All of them in some way or form being web based. The one project that really stands out for me and will actually go down as the highlight of my career so far was the Snow+Rock Pathfinder application. 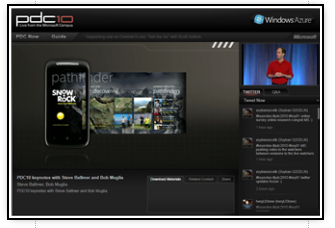 This Windows Phone 7 application started life as a pitch to Microsoft for a showcase application that was passed over in terms of showcase application in favour of other bidders. Luckily for Sequence one of these other bidders pulled out and left a gap that because of our designs and how the application was shaping up we were able to fill. This resulted in me working closely with the Microsoft DPE team working very hard to get the application to pass the high Microsoft quality baseline right up to the make or break point before it got installed on a bunch of press phones for the pre launch event. The biggest highlight was when Paul Foster of the DPE sent an email letting me know that the app panoramic had been used during the professional developers conference (as you can see in the pic). Pathfinder is still winning awards and only last week won an award at the Cardiff Design Festival. The other technologies that I have had the pleasure of using have included Azure, SharePoint, Silverlight and Dynamics CRM this goes to show that the whole of the Microsoft product stack is what interests me and I enjoy producing solutions with. Sequence has built a reputation for great design and do constantly deliver well designed web sites but the opportunity to work in any medium other than HTML are scarce. Now the time is right and I feel that I would like to work on some projects that push my buttons, I find XAML a much more exciting way to build UI’s that feels so much more right and polished then HTML. That said I won’t be totally abandoning Web based projects but variety is the spice. I would like to take this opportunity to thank the people at Sequence for making the last 4 years hectic, interesting, taxing … well everything you would expect when working at an agency! I am moving on to a much smaller firm that’s a little closer to home. Here I will have the opportunity to push those buttons of mine. Up until now Sequence have been kind enough to help with the group even going as far as providing the drinks. Another thing that I would like to thank them for. The group is however going with me and I will continue to organise events. Yes things have been quiet recently and I do apologise for that but plans are afoot so expect some news soon. There was I thinking that my exam didn’t go well but this morning I got notification that I had passed the exam! This is the 1st time that I have been an MCP in any way. I am well chuffed!